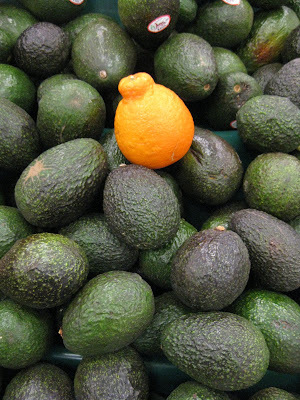 Living in Mexico and being 5'10" Tall with very pale skin, blue eyes and light hair I feel a little like the tangerine at times. 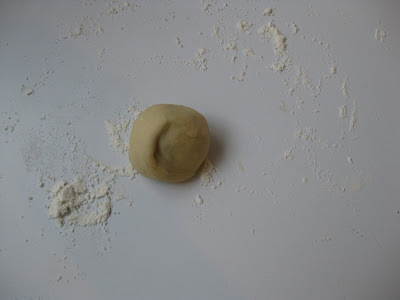 I have followed Ben's Blog, What's Cooking, off and on for some time now and recently he started a Homemade Challenge where each month there is a theme of something that you can make yourself. Month one (February) was homemade cheese. Well I missed the cheese I did manage to get involved in in March Homemade Challenge of making Bread. 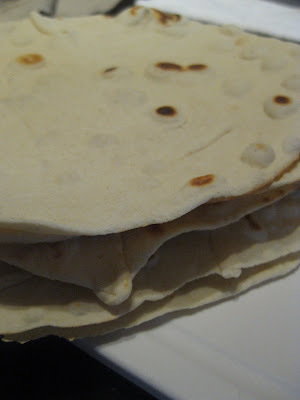 At first I wanted to make some flat bread to go with a dish that I wanted to try that my friend Warda posted over at 64 sq ft Kitchen called Tchicha bel Khoubiz and then a few days later Diana Dyer posted her version of Tchicha bel Khoubiz over at 365 days of kale. I had this dish for the first time at a Food blogger get together last summer and enjoyed it very much. Thank you Warda! 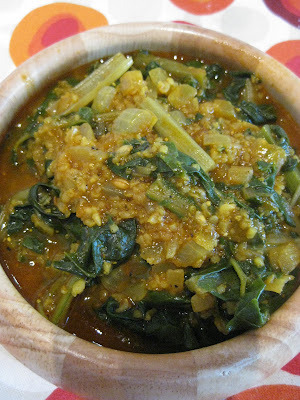 Please visit Warda's blog for recipe. 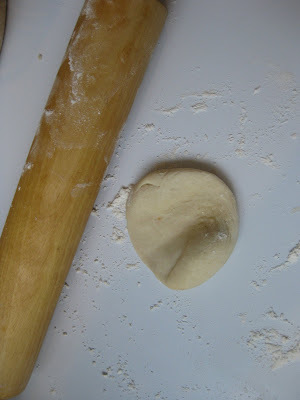 mix dough, knead for 10 minutes. Let rest for 20 minutes. Divide into 6 equal balls. Roll out paper thin. Cook on hot pan for 30 seconds a side. Done! ok, I know that I have been missing in action on the Daring Baker circuit for far too long. I have good reason though, we moved. We did not just find a new house we moved from Detroit Michigan to Mexico City. Moving to a new country takes a lot of time, effort and focus leaving very little time for such things as the monthly Daring Baker Challenges. I am happy to be back this month with Lasagna. 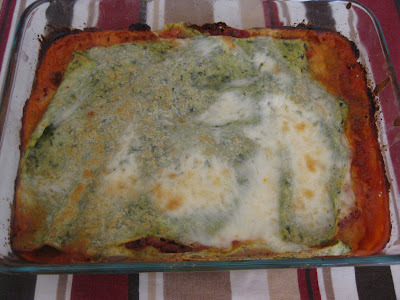 Yes The month of March was dedicated, in the Daring Baker world, to Lasagna made with fresh pasta, regu and bechamel. To tell the truth this is very close to the Lasagna that I make on a regular basis so there was not a lot new for me but it was still very fun. 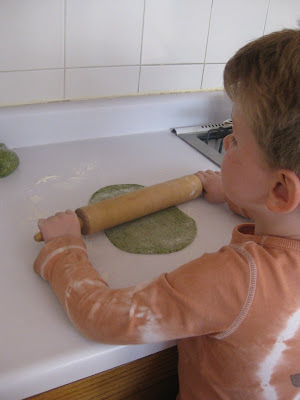 One new thing was making spinach pasta by hand. 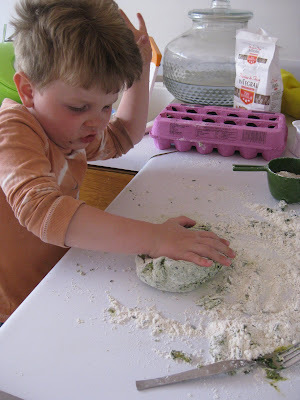 I have made pasta lots of times but always in my KitchenAid, sadly my kitchenaid is taking a vacation in a storage unit in Michigan so my little man Luka and I had ourselves an afternoon of kneading green dough and taking photos...and, well, having a blast. I made my own standard ragu because I could not bear the idea of going to the market and trying to figure out how to tell the butcher that I need veal shoulder, pork loin, and beef chuck steak all ground up. No Hablo Español here, at least not yet. In a medium to large sauce pan over medium low heat add olive oil and onions, slowly cook onions until they are light brown and very sweet. Add the ground beef to brown. As the beef is browning break it up into little pieces with a spoon. When the been if about half browned add the carrot. once the beef is brown move it to one side of the pan and add the garlic and tomato paste to the cleared area in pan. cook until the paste develops a dark color, maybe about 1 minute then add the tomatoes and water (use the water to rinse the rest of the tomato sauce out of the jar). use the tomatoes and water to deglaze the bottom of the pan. cook the sauce for about 5 minutes then add the garlic powder, Italian seasoning, salt and pepper and cook for another 10 minutes. Taste to be sure that the sour, sweet salt in the sauce is balanced. At times, if the onions or carrots are not very sweet, a teaspoon of sugar may be added to the sauce to offset the acid of the tomatoes. 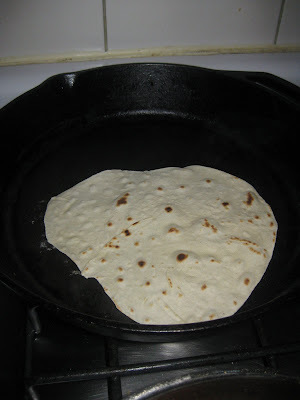 Heat the olive oil in a 12 inch (30cm) skillet (frying pan) over medium-high heat. Have a large saucepan handy to use once browning is complete. Add the pancetta and minced vegetables and sauté, stirring frequently with a wooden spoon, 10 minutes, or until the onions barely begin to color. 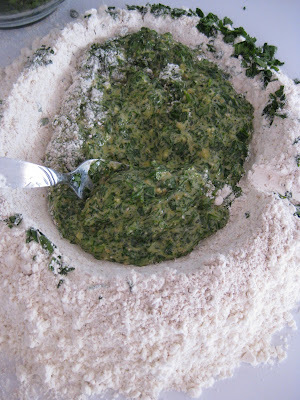 Coarsely grind all the meats together, including the prosciutto, in a food processor or meat grinder. Stir into the pan and slowly brown over medium heat. First the meats will give off a liquid and turn dull grey but, as the liquid evaporates, browning will begin. Stir often, scooping under the meats with the wooden spatula. Protect the brown glaze forming on the bottom of the pan by turning the heat down. Cook 15 minutes, or until the meats are a deep brown. Turn the contents of the skillet into a strainer and shake out the fat. Turn them into the saucepan and set over medium heat. Reducing and Simmering: Add the wine to the skillet, lowering the heat so the sauce bubbles quietly. Stir occasionally until the wine has reduced by half, about 3 minutes. Scrape up the brown glaze as the wine bubbles. Then pour the reduced wine into the saucepan and set the skillet aside. Stir ½ cup stock into the saucepan and let it bubble slowly, 10 minutes, or until totally evaporated. Repeat with another ½ cup stock. Stir in the last 1/2 cup stock along with the milk. Adjust heat so the liquid bubbles very slowly. Partially cover the pot, and cook 1 hour. Stir frequently to check for sticking. Add the tomatoes, crushing them as they go into the pot. Cook uncovered, at a very slow bubble for another 45 minutes, or until the sauce resembles a thick, meaty stew. Season with salt and pepper. chamel and cheese will overcook by the time the center is hot. tinged with a little gold. Turn off the oven, leave the door ajar and let the lasagne rest for about 10 minutes. Then serve. 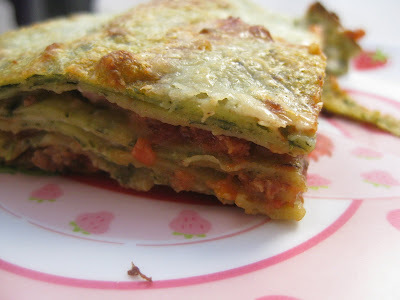 This is not a solid lasagne, but a moist one that slips a bit when it is cut and served. I have not yet had many opportunities to try a lot of Mexican street food but what I have tried so far I have loved. The only complaint that I, if it is even a complaint, is that some of the things could use a little more salt. However, I have been known to add a lot of salt to my food. 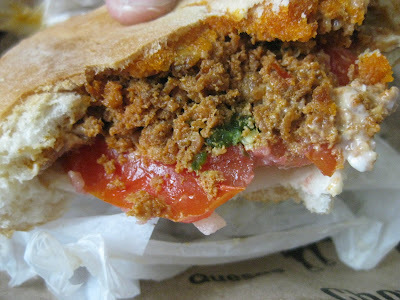 The first real regional item we had after moving here was Tortas Chorizo, torta being a sandwich. 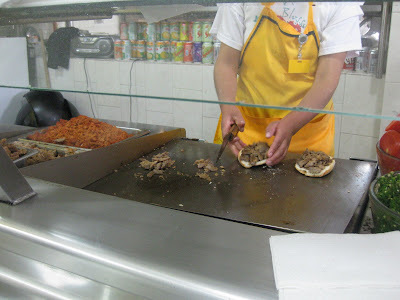 Toluca is know to have the best Cherizo in Mexico and the locals in Toluca say the best chorizo sandwiches are at La Vaquita Negra. 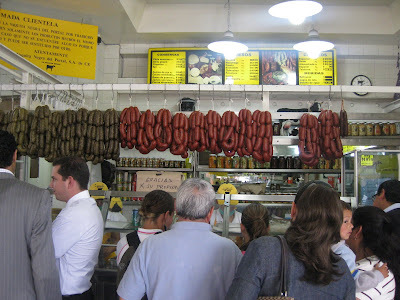 Now I have not gone around eating sausage sandwiches after sausage sandwich to be sure that they have the best Tortas Chorizo. With a sandwich as good as that I can imagine that it would be very hard to beat, and that is a lot of fat I would rather not consume. 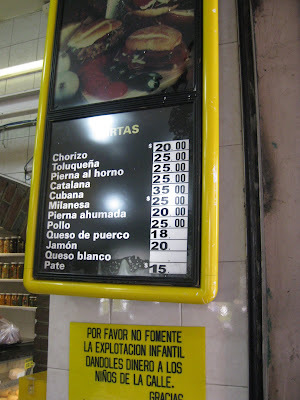 These Tortas Chorizos are good sized and they can be topped with chopped jalapenos (which are HOT in Mexico unlike in the US), tomatoes, onions, and creme (a runny sour cream) as seen below and this will cost you 25 pesos or 1.73 US dollars. We also tried the torta cubana which was really just way too much with chorizo, cheese, and ham! We also tried the torta milanesa (I think that is what they are making in the photo above) which was good but paled next to the torta cherizo. 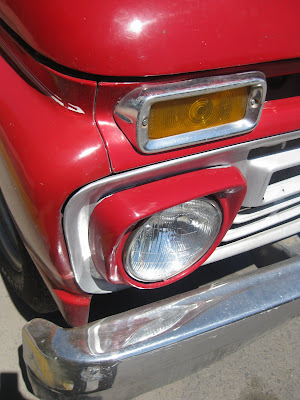 Sorry I have been neglecting my blog for the last few weeks but we moved. We are finally not living in a hotel but in a house. We moved in about two weeks ago but did not have Internet right away and we have to find a by furniture. that takes some time you know and we are not done yet after 2 weeks of focus. We did find a great little town not far from Mexico city that has shops and shops of hand made furniture but I will save that for a future post. After a few ways I asked my daughter, Z, what she wanted to have for dinner and she said oatmeal cookies. While I did not give her oatmeal cookies for dinner I did set off to purchase all the necessary equipment for making them and within days we were enjoying the wonderful disks. First I had to find a mixer and hubby found a great little Black&Decker hand held beater with oodles of power for only $16. then a mixing bowl, measuring spoons, measuring cups and backing pan were found, purchased and brought home. Now all I need was a recipe and to by the ingredients. 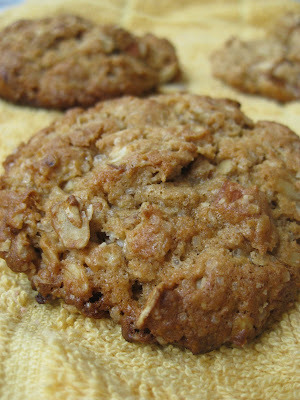 I found was looked to be a great recipe on Smitten Kitchen called Thick, chewy oatmeal raisin cookies. Sounded easy enough so I made my list for the grocery store and, well I was not able to find a few of the basics like baking soda so I had to improvise and that is what follows. In a large bowl, cream together the butter, brown sugar, egg and vanilla until smooth. 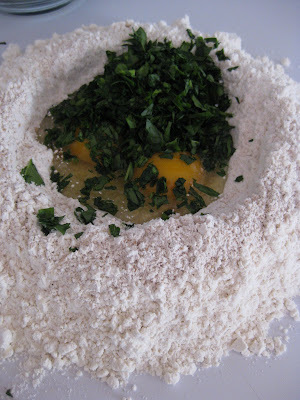 In a separate bowl, whisk the flour, baking soda, cinnamon and salt together. Stir this into the butter/sugar mixture. Stir in the oats, and nuts. 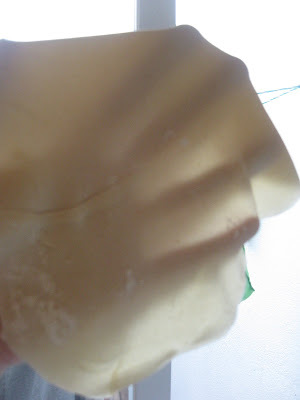 Chill the dough for a bit in the fridge before baking them. 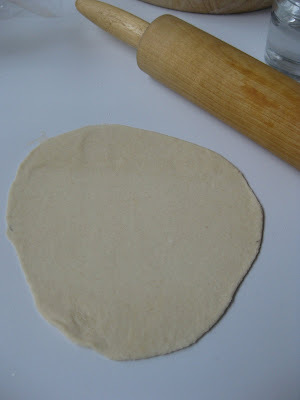 You could also bake them right away, if you’re impatient, but I do find that they end up slightly less thick. The cookies should be two inches apart on a parchment-lined baking sheet. Bake them for 10 to 12 minutes (your baking time will vary, depending on your oven and how cold the cookies were going in, I am thinking that the thermostat on the oven is not working). taking cookies out when golden at the edges but still a little undercooked-looking on top. 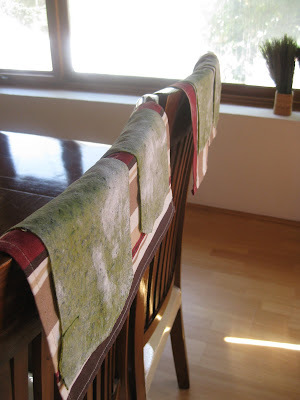 Let them sit on the hot baking sheet for five minutes before transferring them to a rack to cool.